Hey, Leaguers... The League is getting out of the way for Jamie, who has written up some sort of birthday message. While I can't put it as eloquently as Steanso, I would also like to wish the League a most happy birthday. Ryan and I met nearly 15 years ago while I was attending Trinity U (also Steanso's alma matter). We did not start dating until some 2+ years later, but each of the few times we met during those pre-dating years I knew there was something special about him. There was a fascinating mixture of mischief and kindness in his eyes that made him memorable. Thankfully the stars alligned our junior year and we've been together ever since. He proved his worth early on when, already aware of my kidney problems when we started dating, he spent a whole weekend in my hospital room when I was frighteningly (and not attractively) ill. This devotion has continued throughout our relationship, and I cannot count the number of times Ryan has dropped everything to care for me. Visions of him slumped in an ER room chair exhaustedly attempting sleep at 3:00 am come to mind. He has been my advocate and comforter in tough times. Our rough patches were not all medical, and we had a difficult four years living in Arizona. Finding it hard to meet people there, we were forced to rely solely on each other for company (sorry Mel, Jeff, but you do not talk last I checked). Ryan kept us sane with his good nature and humor. We were able to joke with each other about our situation, which made it tolerable. It may seem as if I am highlighting the low points of our relationship, but I am writing under the assumption that everyone out there knows of Ryan in some capacity, even if just through his writing. I find it more telling of a person's character how they react in challenging circumstances and thought some of you may not be as familiar with this side of Ryan. So thank you Ryan, for being my champion, my entertainer, my psychologist and best friend. I love you more than I can express in this short tribute and hope you have the happiest of birthdays. The League turns 33 on Saturday. I know. I look much older and far worse than 33, but there you go. I'm not having a b-day party (we're saving that for Mel), but we are going to go grab dinenr at Artz Rib House on Saturday, sometime around 7:30ish. If you're in town, why don't you pop in and enjoy some BBQ? In addition to seeing me down about 15 lbs. of beef ribs, none other than Austin's own Flyin' A's are playing from 7:30 - 9:30. I figure: you can either show up and have a beer, or have dinner or whatever. We'll probably clear out around 9:30, so you could still have the rest of your night. We're not really planning anything else, but if you want to hang out afterward, that might be arranged. Mel's at #192. You can help! Go to #192 and vote "yes". 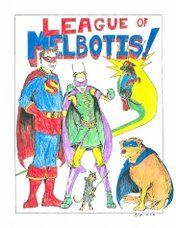 Help out Mel! And then vote "no" on a whole bunch of other Golden Retrievers. I have nothing to share. I wish I did. The weekend was slow. I haven't been feeling particularly great. Jamie has been playing Mario Galaxies, and is much better at it than I (despite my attempts at coaching). Its interesting to see how two people will attack the same challenge in different ways. I don't link nearly often enough to Sleestak's site, but here's a little bit of the way, way back machine. Paired with this post today from Occasional Superheroine, in which Valerie tries to figure out what women want in comics... Anyway, it wasn't that long ago that romance comics were being targeted at girls and young women, and a world which would make Betty Friedan's head explode was pretty much what they were selling. Way back when I was contributing to Comic Fodder, I posted on the topic of what women want in comics, and I admit... the answers were a little less concrete than what I would want as a market researcher. Could have something to do with women being a wide and diverse readership or something. And then young women getting creeped out when they visit comic shops and have to deal with the He-Man Woman hater's club-house atmosphere. I have no idea. But at one point, the romance comics and comedy comics were selling. And it's interesting to note that manga brings both, whereas the average modern superhero comic is supposed to be grim'n'gritty for the most part, and therefore devoid of romance or humor, items which once drew in large numbers. Also, you know, wider distribution channels when you could pick up comics at the drug store. I've also been pondering a bit about the Warren Jeffs' commune interception by local authorities in West Texas. For those of you not familiar, Jeffs led a community in Arizona, Colorado City, which was solely occupied by his followers. The community was comprised of a splinter group from the LDS, which still practiced polygamy, and tended to set up marriages between minors and dirty old men. As the minors were raised in the colony and told Jeffs was a prophet, they didn't know any different, and believed themselves to be doing God's bidding. Colorado City came under fire in the first year or so when we'd moved to Arizona, and it was announced that Jeffs was buying land in West Texas and trying to rebuild his cult fantasy land in the Lone Star State. I had a good laugh at that. Arizona has a sort of "go along to get along" sort of attitude. I guess its a weird side-effect of Goldwater conservatism, but people tend to stay out of each other's business to a much, much higher degree in AZ than folks tend to do in Texas. At least traditionally. Jeffs managed to grab some extra media attention last year when he went on the lam and was arrested (and I think, convicted) for arranging marriages between unwilling teenagers and dirty old men. I imagine the folks of West Texas did not cotton to the idea of polygamist statutory rapists living nearby. Well, it seems things have come to a head. 400 kids have been pulled from the West Texas compound. Whether El Dorado, Texas can absorb 400 kids raised in bizarro-polygamy-cult land into their foster care system remains to be seen. If I seem uncharacteristically judgmental of the Jeffs followers, its because I consider them to be evil, evil bastards. Essentially Jeffs has found followers who managed to lay claim to the city government of a corner of Arizona, and were able to milk the system for years, use their official power to keep official power out, and had systematically set up a system to keep women/ girls uneducated and, essentially, as breeding stock. Further, I am deeply suspicious of what became of many of the young men of the community. If each man could have many wives, the math doesn't add up. And while some young men were run out of town... I'm just saying. So if the El Dorado authorities seemingly overstepped their boundaries, in this case, maybe I understand. What was going on behind the walls of the compounds was not a secret. In fact, In Arizona it was very well known thanks to a few women who had escaped. (And I do mean escaped. These women were more or less free to stay and be happy, or... leaving was not really an option when you knew no one outside and were told Satan himself controlled the world outside the city). I would like to hope that everything that has occured has been "by-the-book". Letting the Jeffs cult have any legal ground to stand on isn't any good for anybody, and many of the 400+ pulled from the community might now actually have a chance to have some say in their lives, not have their lives directed by cult leaders. Anyhow, I'm tired. I'm going to bed. Toll the bells, and come not to me with words of good cheer, Leaguers. Aye, turn your eyes neither toward Earth nor Heaven in joy, but let them hear your weeping and lamentations. So above, so below. The great one is gone. He shall stride the world no more. Ne'er again shall we see his like. His grace. His very Chestonness which made him the Cheston. He's been called home by the cosmos, too great for this wretched world, yet always making this orb greater by his presence. I say adieu. And goodnight, sweet prince. The world shall be poorer without your light. 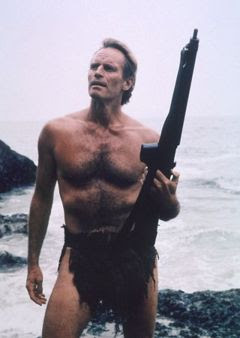 Charlton Heston has merged with the infinite. The League is in mourning.